These tips are for baccarat players that are trying to use a strategy to increase their odds of winning, and they apply specifically to the game as played in an online casino, rather than the real life game. They apply in particular to gamblers using a strategy or system, more so than to general baccarat play. There are no tricks here that will give you an advantage; just good advice. It may seem obvious, but before playing in a new casino check that the odds on offer for all the baccarat bets are correct. The normal commission deduction on Banker bets is 5%, but I have seen some casinos charging 25% on this bet. Some places will offer less than 5% too, which is great, so watch out for those. The normal odds on the Player bet should be evens (1:1). That never varies. The Tie bet is almost always 8 to 1, which is of course terrible value and should be avoided. Most standard baccarat tips will tell you to bet the Banker bet, as it has slightly better odds than the player bet. For players following a strategy however this is bad advice. You should always bet the player bet when you are using a betting strategy. The slightly lower than evens payout (after commission) on banker bets will cause a problem in progressive systems. As an example of this, lets look at a person using the Martingale system of doubling up after each loss until they hit a win. I am not suggesting that you play that system, by the way. This is just for demonstration purposes. This hypothethical player is betting $10 on the Banker and doubling the previous bet until they hit a win. Lets say this player experiences 4 losses in a row, and wins on the fifth hand. That is not at all unlikely. The first four losing bets are for $10, then $20, then $40 and then $80, totalling $150 staked and lost. The next bet on the banker hand is for $160 and thankfully it wins. The total payout – $160 stake plus $160 win – is $320, less 5% commission, which means the player gets back $304. The total stakes were $10 + $20 + $40 + $80 + $160 which comes to $310. So even though the player finally won his bet, it resulted in a net loss on that sequence of $6. A similiar run of losses while betting the player hand would have given the expected 1 unit of profit, that is $10. This goes against the “Stick to the Rules” tip listed below but it is good advice nonetheless. 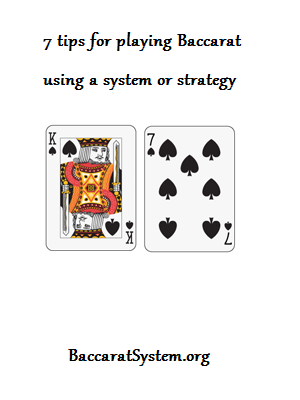 Before starting your session work out what you can reasonably expect to win with your strategy. If your starting bankroll is, for example, $500, then you should figure out what amount of profit you would be happy to walk away from the table with. Whatever that number is – $100, $250, $500 or even unrealistically $1000 – if you should reach that amount in profit early in the session you should quit then. You can always come back another day. The house edge will get you in the long run. No system or strategy has ever been found that will overcome the built-in house advantage. If you decide beforehand how many games you are going to play, say 100 or 200, and count them as you play (you will record the results of each hand anyway if you are system betting) then you will be more prepared to accept a loss on your session and walk away, instead of playing on to try to recover your money. When you are winning, too, shorter sessions work in your favor. After you reach the number of hands you decided to play, you will be more likely to accept whatever profit you have, even if it’s an odd number like $67. If you are playing without any set limit you may see that you are up $67 and decide to play it up to a nice even $100. That’s a sure fire way to lose it all back. When you have decided on your system and started playing, no matter what kind of run you experience it is best to stick with the rules of the method that you are playing. Unless you hit a fantastically good run early on and decide to take your money and run (See “Quit when you’re ahead, above) you should ride out the cards in order to be true to the betting strategy you are using. Many players will get frustrated when bet after bet loses, and after five or six losses in a row they might be tempted to increase their bet massively in order to recoup their losses in one hand. It is better to stick with your plan and try to be more philosophical about any losses. You’re playing a system, you know there will be losing sessions. Accept it, and follow the rules of your strategy. If it’s a system worth playing, it’s worth following it properly. This tip does not only apply to baccarat; it is good advice for all gamblers and all system bettors. You will have losing sessions, just like you will have winning sessions. Your number one priority is to ensure that you have enough money in your bankroll to get you through the losing ones. As a guideline, take the total amount of funds and divide it by ten. That amount is what you can play in any one session. If after five sessions you have not had one winning one, it is probably time to try something else. And you will still have funds to do just that. Before depositing you should check the terms of any casino bonus you may be playing for. 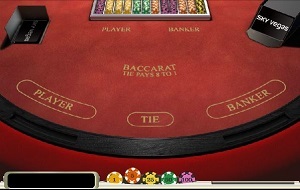 Many sites do not allow baccarat in the wagering requirements for releasing the bonus money. If they do allow it, they may require you to gamble more than you would be required to gamble at other games. It is better to know in advance so alwyas check the small print. Some players are still a bit wary of playing in an online casino. If you want to be certain that the cards are random you can play in a live online casino with real dealers, and watch the cards being dealt. Bonus Tip – Don’t buy systems. One final piece of advice I would like to give, though it’s not really a tip, is that you should never buy a system or strategy for winning at Baccarat. If you have already bought some, don’t buy any more. They are a complete waste of your money. If you are tempted to buy one, check for reviews online. You won’t see many players claiming that they made money from any of them.